Another Monday....Another TechnoStamper Sketch....This weeks sketch can be used with just about any image you have on hand. 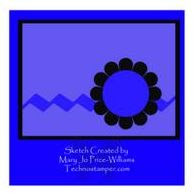 I used my Just Rite Monogram Stamper (C-30) to make some quick monogram cards using this sketch. The beautiful designer paper is from The Paper Loft - Queens Garden WW361, available at Croppinsville. The C-30 monogram works great with SU's punches, I stamped my monogram and punched with the 1-1/4" circle, then layered on a black 1-3/8 circle, Rust Scallop, then a Mary 2" Circle. The ribbon is unknown from my stash - but I felt it went well with the papers. Here's the original sketch - as you can see I choose to make my panel larger...but still the basic composition of the sketch, right? Wow, Lisa! 20 sketches for you! Where do you get the time?! Another LOVELY card! love that paper. 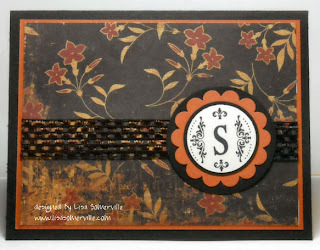 I love the colors and papers and of course that monogram stamp set. Wonderful card. Thanks for playing. Lisa, this card is just jaw-dropping gorgeous! That b/g paper is luscious! Great card Lisa, I like the monogram set.